I was recently given a complimentary custom notebook to review from Blurb. I decided it would make a great birthday gift for my mom who has her birthday right before the holidays. I knew my mom would be excited to have some photos of her new grandson to show off to her friends, so I decided to fill it with photos of her and my dad with the baby and other family photos. The cover of the notebook. At 6 x 9 inches, the notebook would be good size to throw in her purse or a tote bag, and she could write any notes, phone numbers etc. that she would normally jot on random slips of paper in her purse. 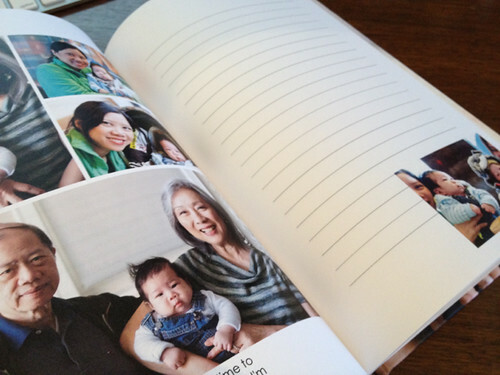 You build the custom notebook the same way you would a photo book using Blurb’s BookSmart software. You have a lot of custom choices. 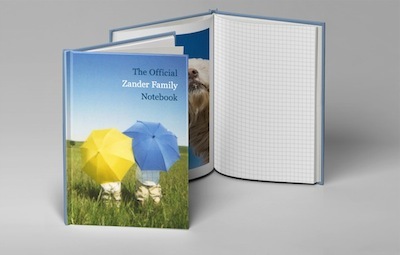 Unlike other notebooks that may allow you to only customize the cover with a few photos in set templates, because you build it like a photo book, you can decide to put as many photos on as many pages you like and leave other pages blank. You can see a thumbnail view of your pages in the software for a complete preview of all your pages. You can also rearrange the order of the pages quickly by dragging and dropping. 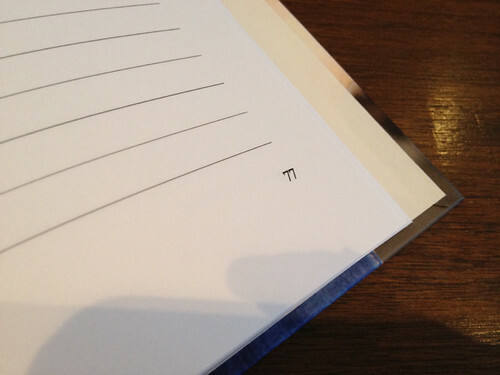 You can also choose blank pages, or from various types of lines or a grid for the notebook part. This sample shows the grid option for the blank pages. The layouts are fully customizable. One new feature I noticed recently is that Blurb’s software auto detected that I made edits to a few of my photos in iPhoto (Mac’s photo management software) and asked if I wanted to update them in my book. That was a welcome feature. For more on Blurb’s software, check out my earlier post. The paper is 60 pound text weight which does allow for some bleedthrough, (photo books come standard with 80 pound paper) so I suppose if my mom were to write on the back of those pages, it may show through. That’s not what’s preventing her from writing it in however, it seems she’s hesitant because she likes it so much and doesn’t want to fill it with random notes! Oh well, I guess that’s a good problem to have. My book contains 120 pages but you can get up to 440 pages in your notebooks. They also come in softcover version. The book that you see here was $35.95 plus tax $.19 and shipping $7.99, for a total of $44.13. If you know someone who likes to sketch or journal, these notebooks would make a great gift. If you like what you see, make your own custom notebook with Blurb. You can also Save 15% on your entire Blurb.com order. Be sure to check my photo book deals page, or Blurb coupons page to see if any other current promos are available! Happy notebooking! Blurb Mother’s Day GIVEAWAY Winners Announced! Awesome! Photobookbaby is so cute!!! I bet the grandparents are so proud. Have you used Blurb’s “Publish an eBook” option yet? It’s only $1.99 to publish any length of eBook and then it can be downloaded by whomever you give the link to. I created an Instagram book, then bought only the eBook since my mom just got an iPad and both my husband and I have iPhones. I am planning on getting a hard copy after I update the book later. Hi Emily! Yes the grandparents can’t get enough of him 🙂 I haven’t used the eBook option yet, but I did read about it in one of their email newsletters recently. Sounds like a great option and so portable! I definitely am going to check it out. Happy New Year to you! The e-book option is FABULOUS! You will love it! Thanks for the review! I love the idea. I’m a sucker for grid paper for some reason…love that option. The planners look pretty cool too. I will keep this in mind. Hey PBG! Love the review! I have used blurb in the past two years and absolutely love them. 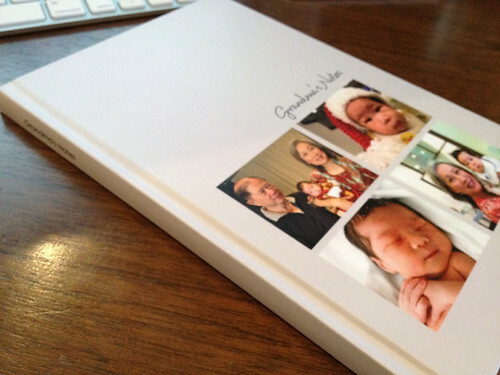 Hopefully i can try out doing that custom book project — like you, i prefer giving custom gifts to the folks. 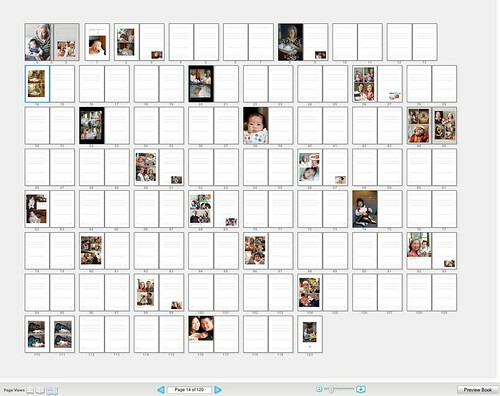 I’m making a journal with just a couple of pictures to use to write letters to my baby girl. Since this will hopefully be looked at by her many years from now, I was a little curious about the paper weight and was wondering if it would make sense to create my own journal with one of their book options to get the heavier paper. Has your mom been happy with the 60# paper (if she ever decided to write in it)? Thanks again for all that you do! I don’t think she’s written in it. ha ha.. She probably is still writing on notecards that she rubberbands together – old habits are hard to break. I think the paper weight was fine, but I think I like your idea of using heavier paper. Best of luck on your book! Ha! I do that with stuff that’s “too nice” to use too, and it sits there laughing at me. Thanks! I’ll take another look at the paper swatches to decide and will let you know how it turns out if I go the fancy route.